I love a picnic. My husband doesn’t always see the appeal and thinks I’m just trying to get out of buying lunch! But I think there’s something brilliant about taking your favourite foods, eating in the open air and having the freedom to run around or just relax in nature. 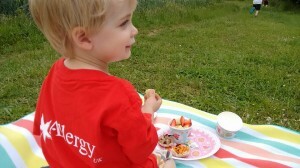 So when we decided to take part in Allergy UK’s Free From Feast last Friday there was no contest. We are lucky that we are surrounded by fields and have a great picnic spot just metres outside our back gate, so we don’t have to travel very far. Dealing with multiple allergies can feel overwhelming and Allergy UK offer a lot of useful advice and reassuring support. They also do a great job at raising awareness on the subject and speaking out in the media, so we are always keen to support them. Earlier this year we joined in their #livinginfear campaign and made a video about living with anaphylaxis and it is great to know there is a charity out there that understands what we are dealing with every day. 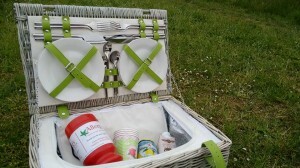 I have always wanted a proper picnic basket so I was thrilled when The Basket Company, sponsors of the Free From Feast, asked if I would like one of theirs. It is beautiful and totally lived up to my expectations! It is an antique wash wicker basket and has lovely bright green straps, real china crockery and metal cutlery. It is made for 4 people so is perfect for a family picnic and even better, the basket has an integral cool bag so you don’t need to take one separately. I just want to eat all my meals out of it! 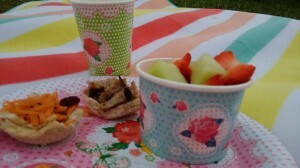 We were also sent some lovely paper crockery to brighten up our picnic from party supplies firm Dazzle. They are a family firm with a great range of lines including this ‘Fancy That’ design which has a great summery vintage style. I particularly liked the little flags which look super cute but are also very practical when you have lots of people with different dietary needs. We had a great afternoon playing in the sunshine and enjoying a feast of J’s favourite safe foods and I’m sure there will lots more free from farm picnics in our future! 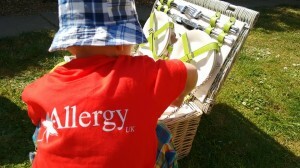 You can Donate to Allergy UK here and help them continue their important work. Previous Post: « Free From Feast Friday! This is lovely! We also deal with allergies and it can be tough. 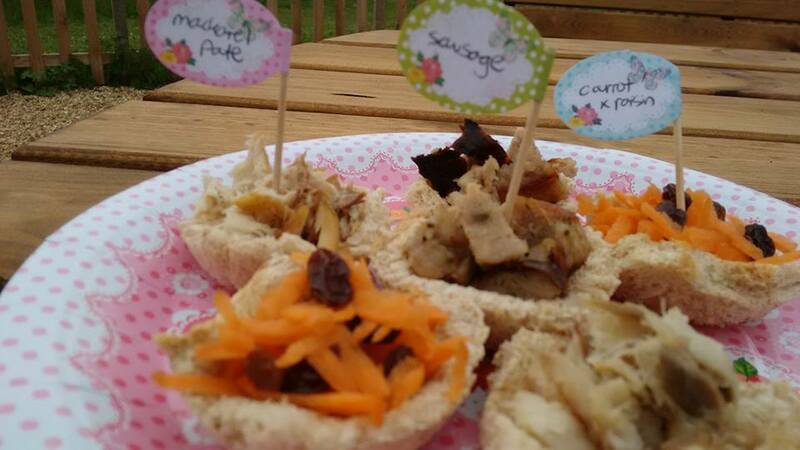 Well done on a beautiful picnic! Thanks! It’s always great to find a positive way to address the allergies we deal with every day. We are in the same boat. It is tough. I have one of those big cool boxes that we can plug in to the car or any socket as we always travel with food. It is heavy but great. I love the look of the traditional basket though. We always have a mini picnic with us wherever we go! But it’s nice to make a thing of it rather than it just being a necessity. Yeah it’s lovely to let the kids run free outside. It was a fun way to support a serious cause.